Honey bees will definitely benefit from the U.S. Department of Agriculture's announcement Tuesday that it will provide nearly $3 million in technical and financial assistance to farmers and ranchers in five Midwestern states (Michigan, Minnesota, North Dakota, South Dakota and Wisconsin) who plant cover crops and hedgerows. Three million isn't that much when you look at the big picture--the agricultural picture. As Agriculture Secretary Tom Vilsack said: "Honey bee pollination supports an estimated $15 billion worth of agricultural production, including more than 130 fruits and vegetables that are the foundation of a nutritious diet. The future security of America's food supply depends on healthy honey bees." Vilsack added that the funding should help "American's beekeepers combat the current, unprecedented loss of honey bee hives each year." The federal support also means a better habitat for other pollinators, including native bees. This should really boost our declining bumble bee population. The need for more bee forage in the Midwest is crucial. Many commercial beekeepers in these five states truck their bees to California for the annual almond pollination season. California needs 1.6 million colonies to pollinate its 810,000 acres (two hives per acre) and since California doesn't have that many colonies (it's about 500,000), beekeepers from throughout the United States provide them. Why these five states? Because 65 percent of the nation's estimated 30,000 commercial beekeepers bring their bees to California for at least part of the year, according to Jason Weller, chief of USDA's Natural Resources Conservation Service (NRCS). Restoring bee habitat and thus enabling bees to store up for the winter is a "real shot in the arm," he says. More natural bee forage should mean healthier bees. Currently they're being fed such dietary supplements as high fructose corn syrup. NRCS has long provided financial support for hedgerows in California's Central Valley. Rachael Long, farm advisor and director of Cooperative Extension in Yolo County, is among those advocating the planting of hedgerows. 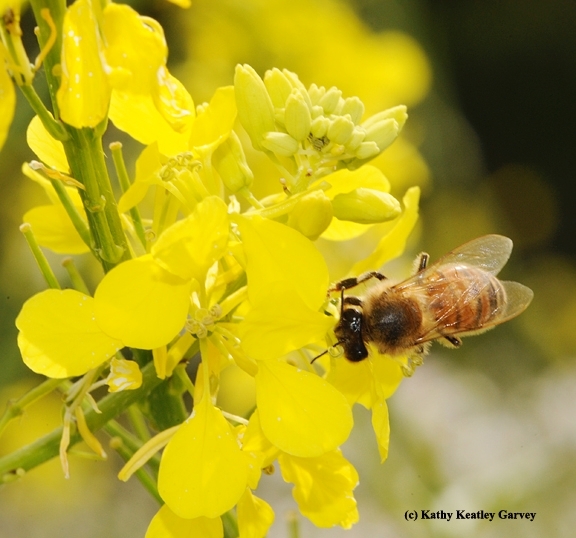 She and her colleagues wrote about their work in peer-reviewed research, "Hedgerows Enhance Beneficial Insects on Farms in California's Central Valley." published in the October-December 2011 edition of California Agriculture. Their research details the beneficial insects they collected, including lady beetles, assassin bugs, minute pirate bugs, damsel bugs, big-eyed bugs and tachinid flies. "The greatest abundance of beneficial insects was collected on California buckwheat, followed, in decreasing amounts, by coyote brush, elderberry, coffeeberry, toyon and California lilac," they reported. Meanwhile, it should be interesting to see how much NRCS' push for more cover crops and hedgerows in Michigan, Minnesota, North Dakota, South Dakota and Wisconsin will help our nation's honey bees and other pollinators.